What Colors Are Flying Squirrels? While there are different species of flying squirrels around the world, they generally sport the same colors in their coats. From the Northern flying squirrels of Canada and the northern United States to the Japanese flying squirrel of southern Asia, these creatures all have markings that make them distinct, while sharing common aesthetic traits. 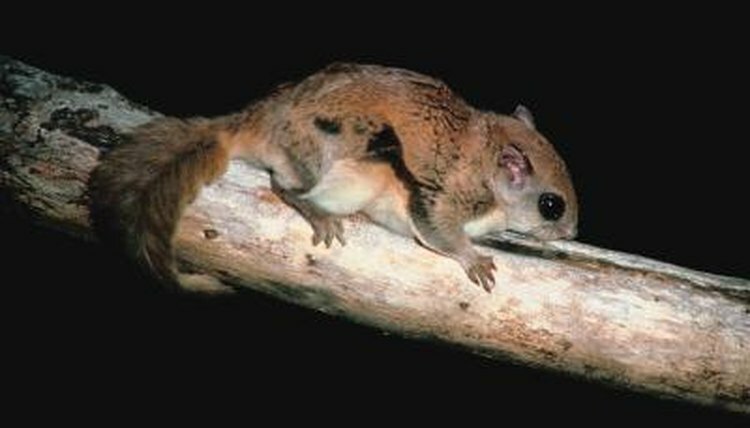 Generally, flying squirrels have predominantly gray-and-brown coats, with generally white underparts, though they vary from species to species. For example, Northern flying squirrels have more of a cinnamon tinge to their coloring, making them slighter darker than Southern flying squirrels, and with more red undertones. The Southern flying squirrel, on the other hand, has lighter, slightly olive tones to his fur. Compare these to the Japanese flying squirrel, who has a yellowish coloring to his otherwise brown, white and black fur. Whatever undertones a flying squirrel has to his coat, he shares an overall brown and white coloring with other species around the globe. What Are Two Other Names for a Flying Lizard?